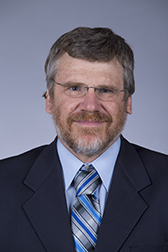 Peter Taylor, director of the National Concrete Pavement Technology Center located at Iowa State University, participated in a Grand Rapids, Michigan, news conference on September 20 with staff of the Michigan Department of Transportation. The topic was the deterioration of a Michigan state highway. The CP Tech Center is administered and housed at the Institute for Transportation at ISU.